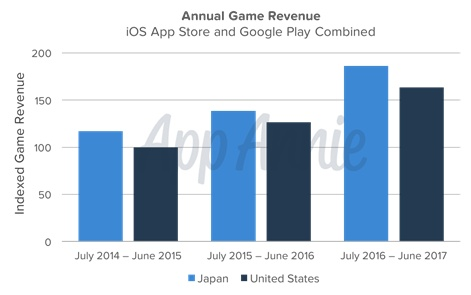 Mobile gaming revenues in Japan increased by approximately 35% year-on-year in the 12 months ending June 2017, according to a new report. 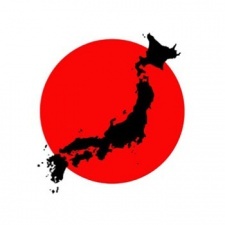 A study by App Annie, in partnership with marketing agency Dentsu, claims that Japan's mobile revenues have now surpassed the US for three years in a row despite that country having three times as many smartphone users. It should be noted though that much of Japan’s mobile games revenue is concentrated in the top grossing games. During the year preceding June 2017 the top 10 titles accounted for more than 40% of all mobile game revenues. Unlike most markets, revenues generated across Google Play and the Apple App Store were fairly similar, compared to a starker gap in the US where the App Store earns developers significantly more overall. The report also noted that Japanese players access their games twice as much as those in the US and is the highest-ranking country in terms of average number of sessions in games per user, also spending twice as much time when they do play. Casual titles and RPGs are said to be the most popular genre, accounting for more than 55% of downloads and more than 65% of all time spent in games. The most downloaded games in Japan defined as RPGs were Super Mario Run, Monster Strike, Fire Emblem Heroes, Puzzle & Dragons and Reverse Othellonia. The top grossing RPGs meanwhile were Monster Strike, Fate/Grand Order, Puzzle & Dragons, Dragon Ball Z Dokkan Battle and GranBlue Fantasy. Despite these games generating huge amounts of revenues, RPG genre share shrank in the 12 months ending June 2017 as location-based game Pokemon GO and sports title White Cat Tennis saw great success and boosted their respective genres. The most downloaded casual games meanwhile were Disney Tsum Tsum, Hidden my game by mom, Rolling Sky, LINE Bubble 2 and PokoPoko. The highest grossers were Disney Tsum Tsum, PokoPoko, LINE Bubble 2, LINE Pop 2 and Tsuri Star. You can view the full report from App Annie and Dentsu here.